Mormon Mommy Writers and Friends: Happy National Poetry Month! 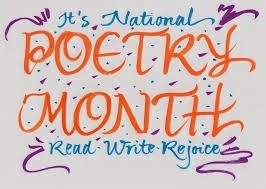 We are eleven days into National Poetry Month, established in 1996 by the Academy of American Poets. The purpose of the celebration, in a nutshell, is to celebrate poetry's place in our lives, and to help ensure that its legacy continues. I myself love to write poetry. My poems sometimes rhyme, but usually do not. I don't have any form for them, although if one were to analyze them, maybe in 100 years in some high-school literature class, form may be found. But mostly, the words bubble up and I write them down. I don't edit them much, and I've learned not to ask for critiques because when people suggest I change the words, it chafes at my poetic sensibilities as if my muse is offended that her offerings were not accepted. For that reason, I'm not sure if my poetry is meant for anyone's consumption other than my own, as a way for me to understand myself. At any rate, for me, poetry happens more than anything. One of my ANWA colleagues, Stephanie Abney, does a whole month of poetry on her blog, Stephanie Says So. She posts a daily tutorial on a different form of poetry and her own offerings in that form, and then invites her readers to try it out and put their poems in the comments. I've learned tons about poetry that I never even knew I didn't know. Encourage a young person to participate in the Dear Poetproject. Write a letter to a poet thanking them for their work. Ask the United States Post Office to issue more stampscelebrating poets. Read the first chapter of Muriel Rukeyer’s inspiring book,The Life of Poetry. Watch Rachel Eliza Griffiths' latest Poets on Poetry video. Get ready for Mother’s Day by making a card featuring aline of poetry. Celebrate National Poem in Your Pocket Day on April 30, 2015. The idea is simple: select a poem you love, carry it with you, then share it with coworkers, family, and friends.